Finally, the day has come, to understand the missing piece of the puzzle, data binding. So far, we have seen how to use interpolations, v-bind for attribute binding and v-on to listen to events. The missing piece was v-model which is used for two-way data binding and this is exactly what we will be concentrating on today! Is your head spinning yet? No worries! We will understand this concept by walking through an example. Populate the text field with the message property’s value, say, “hi” i.e., updating the view with the model. So, the v-model directive tells vue.js to set up a two-way binding for the input field and the message data property mentioned within the quotation marks. All this happens reactively of course! The initial output is as below. The right half in the image shows Vue DevTools pane. The data object with the message property and its value can also be seen. 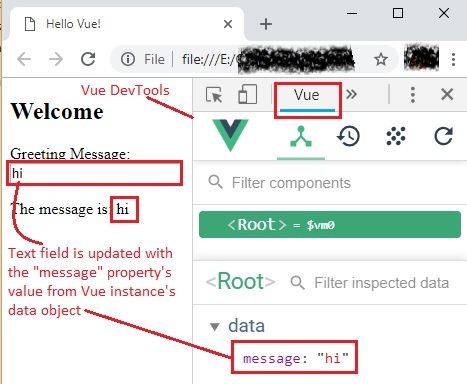 As we change the message in the text field from “hi” to “hello”, with every character that we type, it will reactively get updated in the underlying data model (shown in the Vue Devtools) and updated in the view where we output using mustache syntax in the <p> tag. 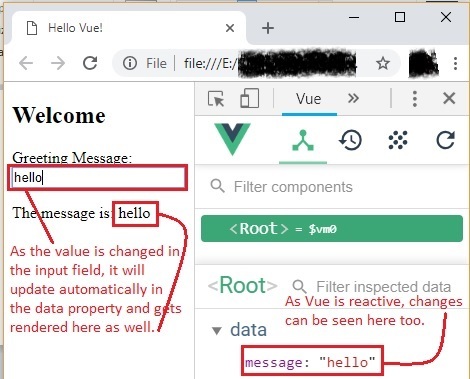 I highly recommend you to open Vue Devtools as shown in the image and change the value in the text field to see this change happening reactively. It will be a feast to your eyes! I can assure that. v-model comes with three modifiers. In case you missed the modifiers part, check this out. Usage: Following the v-model directive, add a dot and specify the modifier. The code is available in the GitHub repo as always. Play around with that and notice how Vue correctly updates the element based on whether the input type is a text field, checkbox, radio button, select, multi-select, text area element and so on… It looks and sounds magical because all the syntax sugar you need to achieve this elephant-sized task is a single directive, v-model. Feel free to give a shout out in the comments section in case you bump into any issues.